The Sweet Girl: The Thinking Woman's Crumpet? 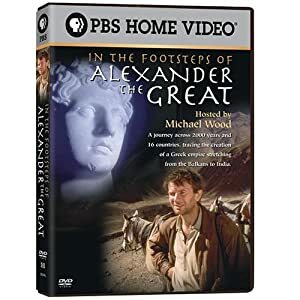 In 1997, the boyish English historian Michael Wood, dubbed the "thinking woman's crumpet" by the British media, made a TV documentary called In the Footsteps of Alexander the Great. (There's an accompanying book by the same name). I'm not sure about the crumpet part, but the four-part series is a fascinating recreation of Alexander's epic Eastward journey, from Macedonia to Persia, Egypt, Babylon, Afghanistan, India, and part-way home. Wood wades chest-deep through the sea to get around rocky headlands where Alexander's troops would have done the same, chats with locals as though Alexander passed through the day before yesterday, compares ancient and modern military maps, and encounters in country after country variations on the rumour that Alexander had horns (and killed all his barbers to keep the secret). Utterly entertaining and not hard to find (I borrowed it from the Vancouver Public Library).